Why are we kind? Because that is what we do. That is what we are supposed to do. Being kind should be our lifestyle. Whether you’re Christians or not, especially Christians, we have no choice and we have no excuse not to be kind. 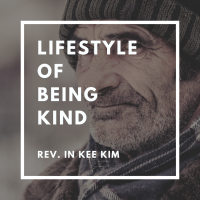 We are called to be kind. Our lifestyle has to be a lifestyle of being kind. That makes us feel good, but also lifts up the spirit of other people. By just being kind to others, we can do so much good, not only to ourselves but to others. Somebody said, “If we choose the path of kindness, we choose the path that leads to God.” I think that is so true. Our lips have to be sanctified. Our mouth has sanctified. We have to find most edifying words and expressions. Before we speak, we have to think about how what we say affects other people. But often when we’re angry, instead of finding edifying words we are finding the most hurting words. The words that can hurt the most. I mean, that’s not right. Even when you’re angry and upset, we should use edifying words as much as possible. St. Paul said to put away from you all bitterness and wrath and anger and wrangling and slender together with all malice. It’s so important about what you say. Being kind to each other in what you say is very important, but it is very unfortunate to hear these harsh words from a world leader, constantly. These days, I don’t even want to read the newspaper anymore. We often hear publicly the words we should not even say in private. Meanness, harsh words, nastiness, swearing, foul language, bullying, racist slur, sexual innuendo, and intolerance. These are the words we often hear from the so called world leader. I wonder whether that is a reason for impeachment. I hope that it is. But we hear that so regularly, it’s almost like daily language. We shouldn’t do that. The words should not allow that to happen around us. We should be careful about what we say because we can save a person or destroy a person by what we say. I believe that there is a magical word that we should always keep on our tongue. You know what that is? To me, that is: thank you. Thank you is a magical word. We should always put the word thank you on our lips. Daily, we should say this phrase. Thank you. Thank you for being there. Spouses to each other, “Thank you.” Why don’t you look around and say thank you. Just say thank you. I mean, thank you is something that we should always say. Not only when people do a favor for us, but generally we should always keep that on our lips. There’s also magical facial expression that you should wear, and it is better than any expensive makeup, Chanel or whatever. That is, to me, a smile. When you put on a smile on your face, all of a sudden you become the most handsome, most beautiful person. Some time, you go and try to stand in front of mirror and smile, and see how good looking you are. When you smile, you become good looking all of a sudden, but when you look at yourself frowning, it’s so ugly. So, standing in front of mirror, practice and see how you look. When you smile, all of a sudden you become so beautiful. So, on your face, you have to put a smile. On your lips, you should always have, “Thank you.” If that is not what it means to be spiritual, I don’t know what it means to be spiritual. That is being spiritual. But our thank you and our smile have to come from our heart. Empty words don’t have that magical power, but when they come from your heart, our smile and our thank you will do wonders in our lives. We need to see them more. You know, this is one thing that I realize about people. When you focus on yourself, your life shrinks. You become smaller and smaller. But as you put your focus on other people, your life expands. You become bigger and bigger. You become a bigger person. As you constantly focus on yourself, you become smaller, but as you really put focus on other people, being considerate of others, then your life becomes bigger and you become a bigger person. There is no discrimination in kindness. We should be kind to all people. Doesn’t matter who they are, we should not ever lose our kindness to other people. We can never say rude words. We can never treat other people in a rude manner, doesn’t matter who they are. Kindness is pure. It has no ulterior motive. We have no right to treat other people in a rude way. In any situation, I hope that we can put ourselves in the position of being kind. Sometimes, we can show that by holding a door open for someone. You know, living in a condo, sometimes I get annoyed and frustrated. In a condo, there is a garbage chute and when you go there, there are three sections; organic recycling and garbage. The door doesn’t open once you push the button, so I take this organic stuff and garbage and I pushed the button and a door opens and there is a garbage bag. I don’t know whether it’s organic or garbage or recycle, so I have to take it out, and I don’t know why they don’t push that inside if they know what to do. So I take it out and I put my garbage. And also sometimes in the elevator they don’t wait for you, and when they see you coming they close it. I don’t know why they’re in such a hurry, they could just wait and hold the door for each other. If you are one of those, don’t say that you’re from St. Timothy. I mean, just being kind is a basic human thing to do to each other, to live pleasantly. Sometimes, you know, when you are in a group, there are people who feel kind of left out or isolated. Approach them. Let them feel included. That is being kind. Sometimes you hear the stories of the people, sad stories, sometimes stories of sorrow, or pain. You sit down and listen to them. That is being kind. When we have the heart to be kind, I believe that God will give us creative ways to be kind. Think about it, “How can I be kind to other people in any situation?” When you think about it, when you have a heart to do it, God will give you creative ways to do it. Look around, there are many people who need your kindness. My father passed away when he was 60. As soon as he turned 60, soon he passed away. He died of stomach cancer. The doctor said he has six months to live, and those six months were very difficult for me. I don’t know how many times I ran out of his room crying. Once he went to the mirror he was shocked at seeing himself because he was so thin. He lost so much weight, and those last six months were very difficult times. But there was one couple. They visited us almost every day, and the kind of kindness that they showed, I can never forget. You know, what we say or what we do, people forget. But how we feel at the moment, we never forget. Whether it’s a good feeling or bad feeling. What they did to us, to our family, was wonderful. Just a simple, kind act had a tremendous impact and helped us go through that difficult time. Kindness creates warmth. Kindness makes life beautiful. We can remember the kindness for a long time. I pray that our community may create beautiful stories of kindness living together, and I think we can do it. Let us be kind. And that’s what we human beings do all the time. Let us sing together.